The imagination of a four year old is a wonderful thing. It’s not just make believe: Arthur genuinely believes in the worlds he creates inside his head, and seeing them pour forth in his play is the closest I think I’ve ever been to magic. He doesn’t need anything in particular to inspire this – the most seemingly banal of objects can become transformed through his creativity, with sticks and empty boxes being the perennial favourites. Still, though, a well-crafted toy can add a whole other dimension. When I was looking for gifts for last December’s Christmas/birthday marathon, I was drawn to Lottie dolls. 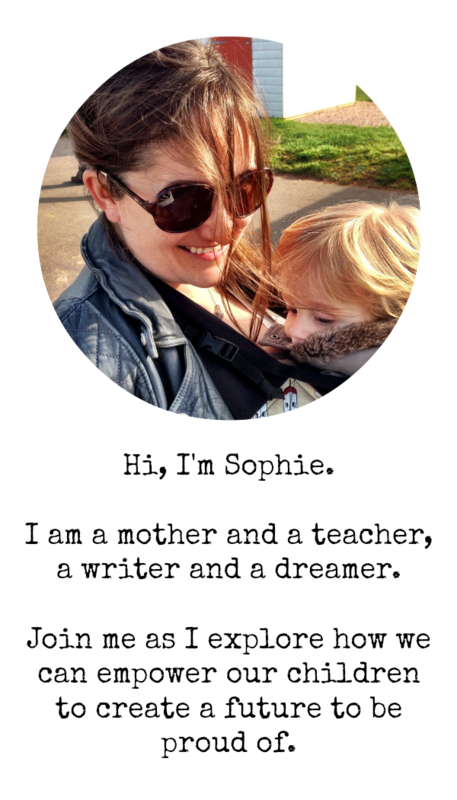 I really like the ethos, and the age appropriate, relatable characters that it has created. 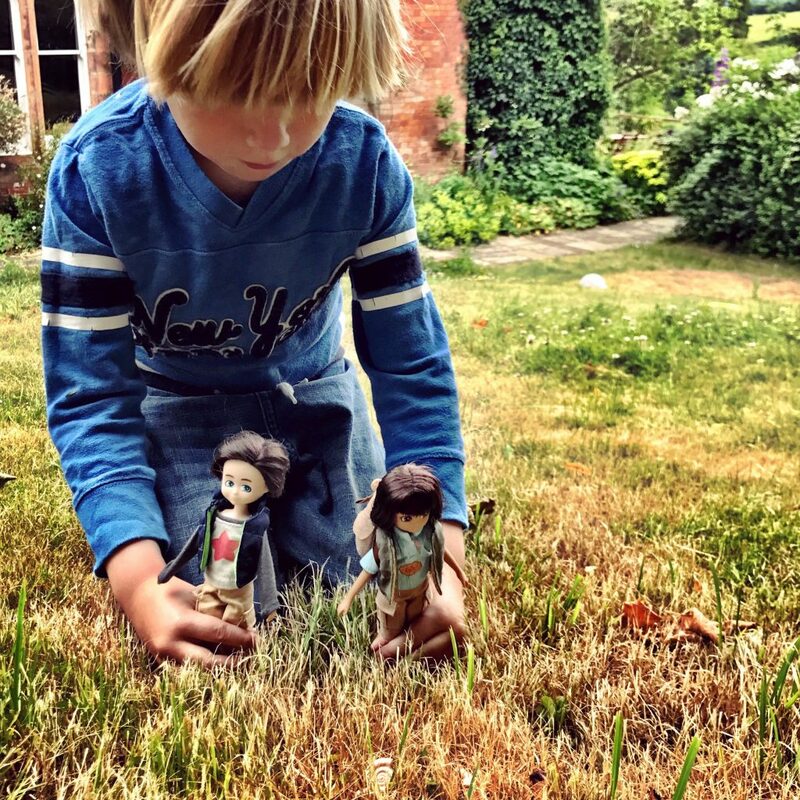 As a starting point for Arthur I loved the Finn doll – his cheeky facial expression, crazy hair and fun accessories – and he has loved playing with him and taking him on adventures. So when I was contacted by the Lottie dolls team to see if we wanted to review a doll on Raising Revolutionaries my answer was a resounding yes. 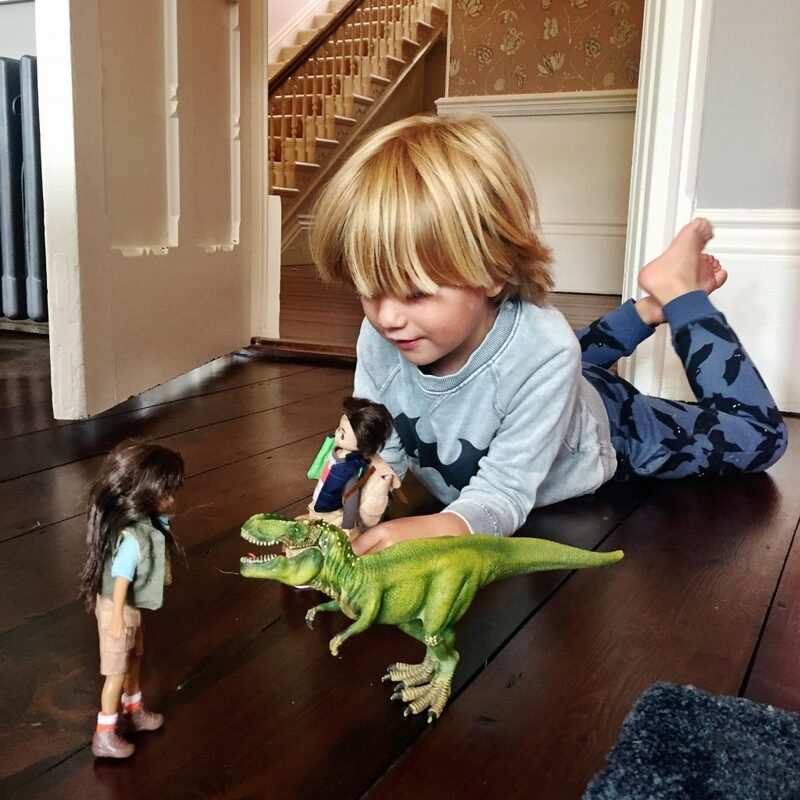 Arthur chose the Fossil Hunter doll, with Biscuit the Beagle as an accessory – though it was a difficult decision with so many cool characters to choose from. 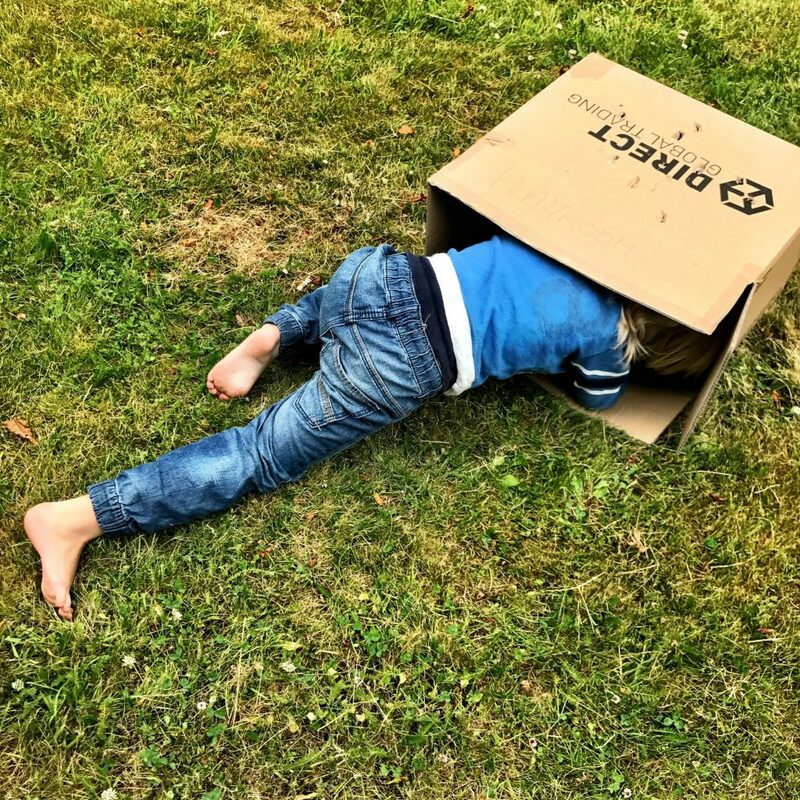 When they arrived, he excitedly unpacked them and took them straight out with Finn to explore the garden, creating them a home in a cardboard box. And then over the days that followed his play evolved. Arthur insisted that Finn carry the backpack – but I’m pretty sure that was only because he thought its contents was so awesome! 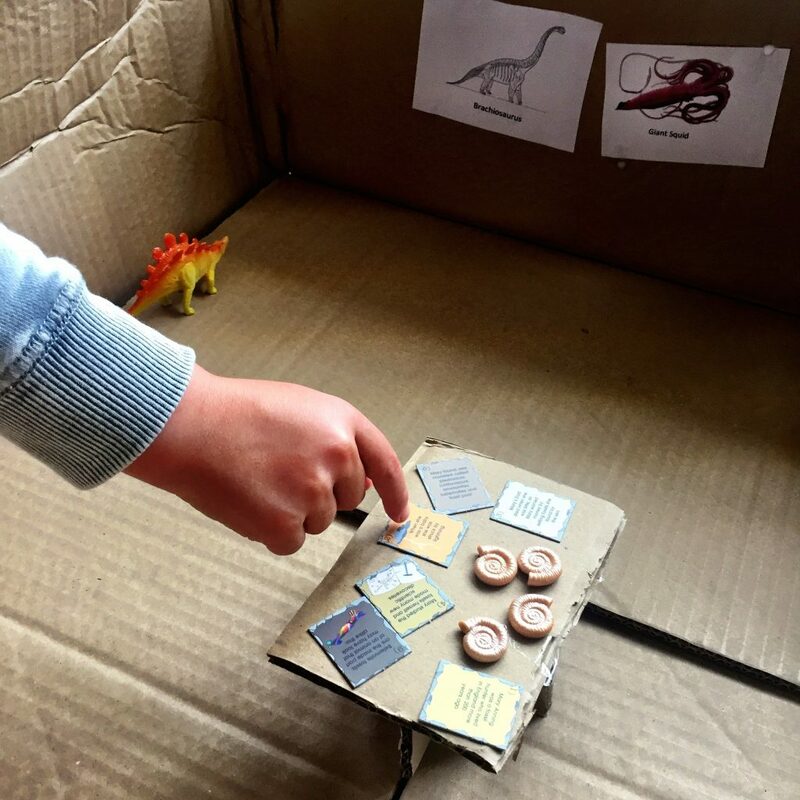 And these came into their own in his next phase of play, when he decided he wanted to build a dinosaur museum. 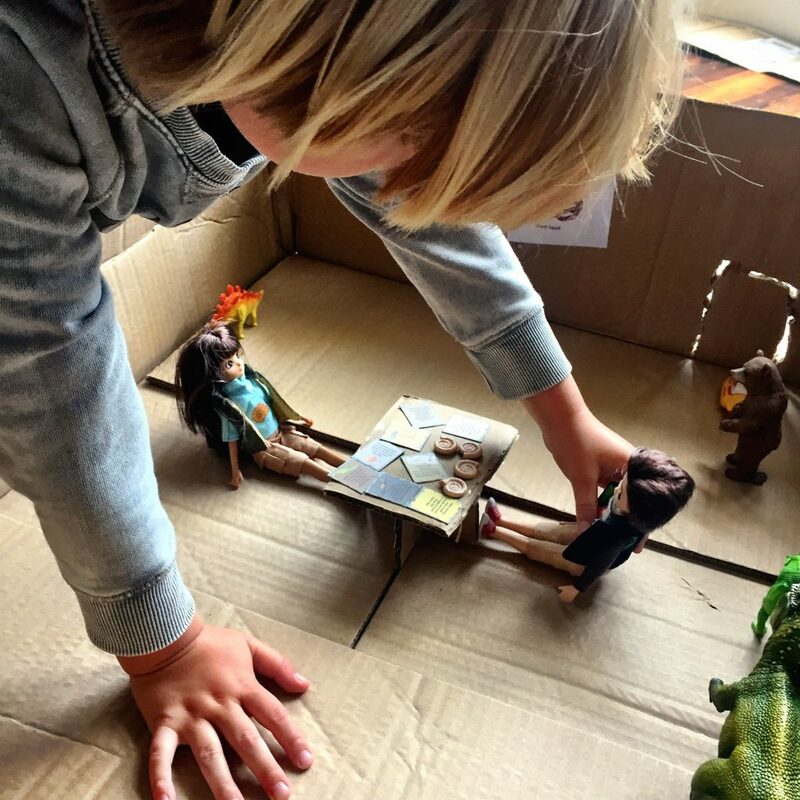 Starting with an empty box (of course), and a bit of time on google images finding some inspiration for the main exhibits, Arthur and I created a ‘dinosaur skeleton museum’ for Lottie and Finn to hang out in. Once we had the basic structure, Arthur carefully unpacked Lottie’s bag, laying out her fossils and tools along with the information cards. 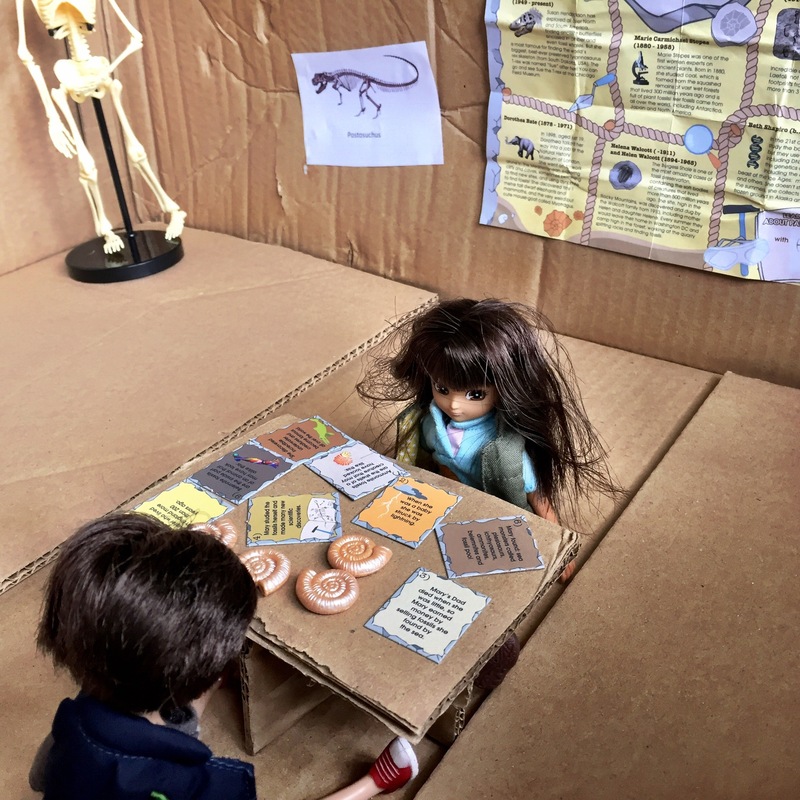 The fact sheet was unfolded and stuck on the wall, and then Lottie and Finn took their places to talk about what they’d found and discuss their next adventure. Arthur was really interested to hear about all of the information on the cards, and was particularly fascinated to learn about the ammonite fossils. He’s super keen to go fossil hunting himself now – I’m just waiting for an opportunity to take him to explore the Jurassic Coast! Biscuit the Beagle had been waiting in the background whilst all this play was going on, but once his owners were settled Arthur decided it was time he joined them – and set his bed up in the museum so he could join in the fun. And there was even more fun for all of them when we headed up to North Devon for the weekend! 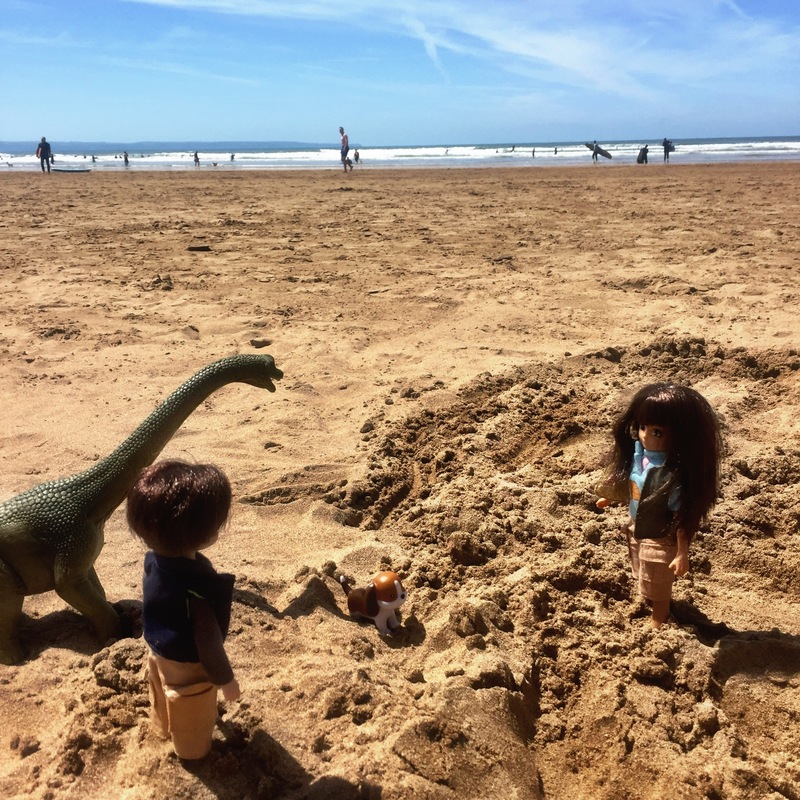 When Arthur was packing his own backpack there was no doubt over which toys would be coming with him – and his dolls and dinosaurs proved the perfect companions for some al fresco play on the beach. It’s safe to say that Lottie and Biscuit are proving an awesome addition to Arthur’s toy collection, and we’re looking forward to many more adventures together! 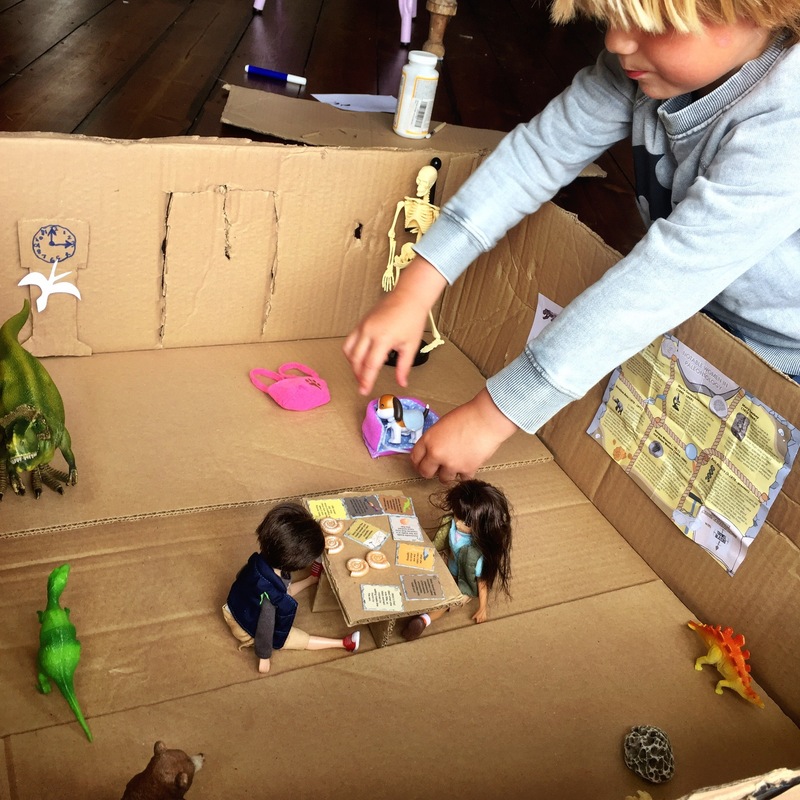 I love how imaginative kids are, and how few props they need to create a completely believable world. These dolls look fab! 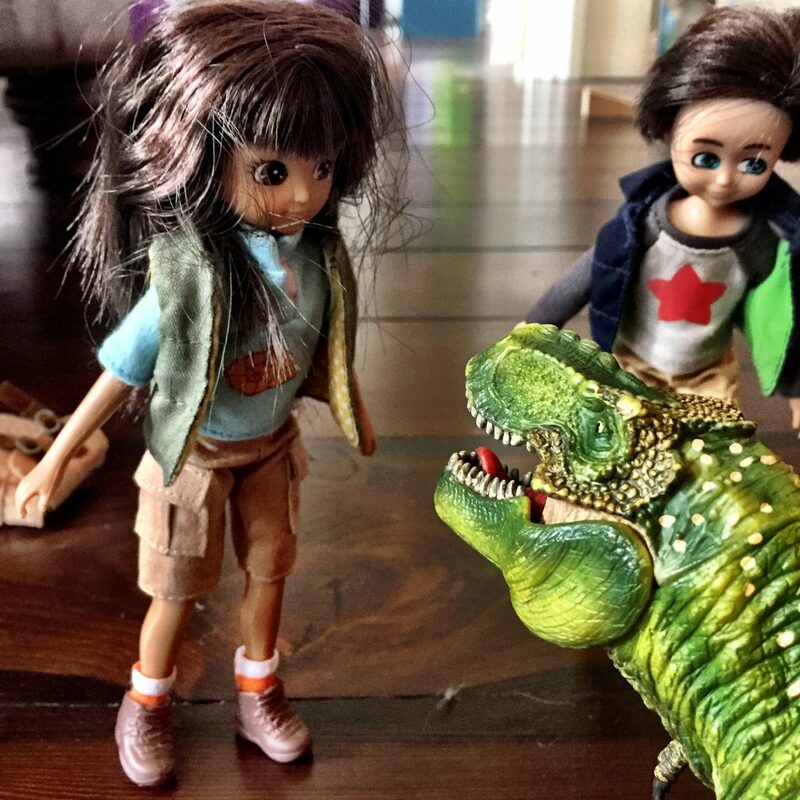 These dolls are amazing, my 3 year old little boy loves playing with his sister’s dolls along with his dinosaurs. I just love the little games they invent, they are so creative at that age. Arthur’s creativity is amazing – I just want to bottle it and hold onto it for ever! Love this so much, what brilliant playing and lovely photos. Oh I love those dolls! They look as if they will become a child’s best friend.